although it was only the LOVE ring which stands out,she still looks amazing. its as if she only needs LOVE, this seems to be Gus Van Sant trademark to over use symbols as themes so he doesn't have to say anything, this is apparent from Elephant too and the silence in the opening of Last Days. I don't know whether this is a good thing or a bad thing? as he obviously convey his message visually, perfectly,a bit over the top?. 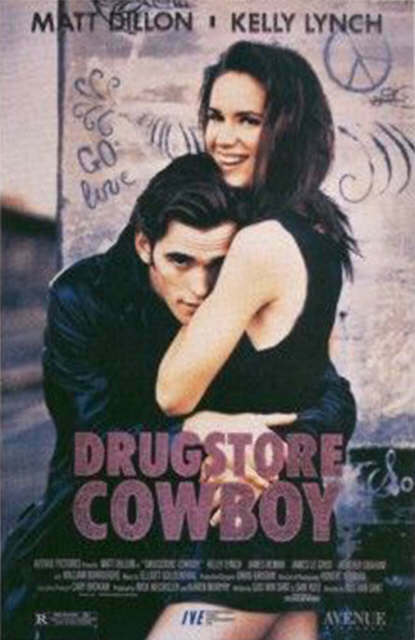 I don't know, its not that I don't enjoy more visual than dialogue , I just think Gus Van Sant's pictures are a tad bit annoying, like the main poster (above) for instance does there really need to be writing on the wall and the cow boy hat and the name?!?! its like match the symbols to the words when you watch it.he does have a good method but its likes as if he's trying to claim a reputation when really someone better skilled should be doing it. the plot line which was based around the character Matt Dillon plays,(name I cant remember because I didn't like it) its although were suppose to learn from it but end up not. however Matt Dillon was a good choice and I liked the name of thee dog Panda. 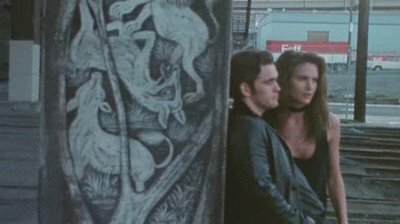 i'm yet to see drugstore cowboy but i think van sant is a really interesting director, he leaves a lot of his film open to interpretation through the lack of dialogue and endless, purely visual scenes. i think the absence of dialogue brings an increased sense of awareness from the viewer, a heightened level of thought. reminds me a lot of kubrick's 2001: a space odyssey where there was extreme speculation into the films meaning, a lot of this thought process, by the viewer, was carried out through the emptiness of the shots.